Getting away for a break can be difficult and upsetting if you have to leave your best friend at home or with a sitter! We always look for pet friendly accommodation when we travel so therefore, here at Fuchsia Lane Farm we offer pet friendly self catering cottages. We do ask that your pet is not allowed into the bedroom and this can cause headaches with cleaning! We have space outside where you can exercise your pet and, once you check with us in advance, there are usually a few fields where you can let them have a run. If you really want to treat you doggie friend to some pampering and looking after why not book a session with Terryglass Dog Grooming Parlour where you can be sure of some special attention for your pet! Many of our regular guests have been to us with their dogs and our Facebook Page has some pictures for you to see! 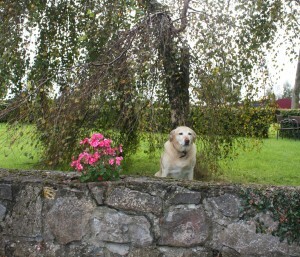 Of course, the main pet at Fuchsia Lane Farm is our own doggie. Holly! She welcomes new friends as long as they are not cuter than she is!